On the occasion of the 72nd Independence Day of India, the International League of Peoples’ Struggle (ILPS) in Canada calls for the immediate and unconditional release of all political prisoners in India. The ILPS in Canada is made up of 25 democratic and anti-imperialist rank and file peoples’ organizations active from Montreal to Victoria, including SANSAD (South Asian Network for Secularism and Democracy) and the East Indian Defence Committee. The Chapter in Canada is part of a global united front organization made up of over 250 peoples’ organizations in 40 countries. The political prisoners in India include Delhi Professor G.N. 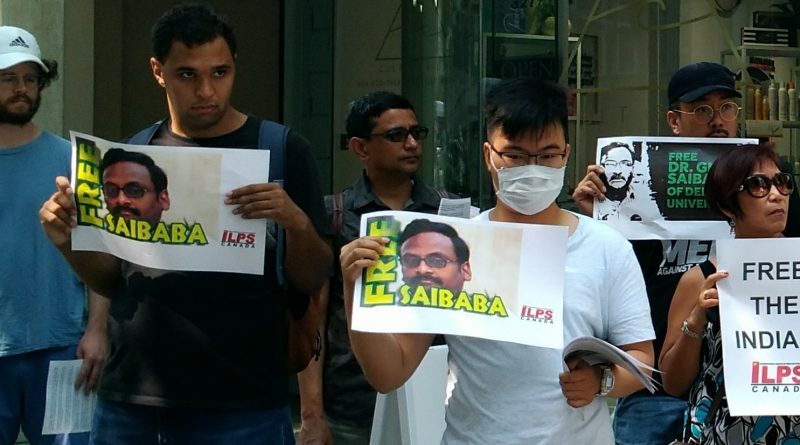 Saibaba and his co-accused, as well as five human rights activists working with Dalits, Adivasis and other political prisoners in India who were arrested in June this year. Professor Saibaba was sentenced to life in prison in 2017, along with Hem Mishra, Prashant Rahi, Mahesh Tirki and Pandu Narote for their alleged links to the Indian Maoists. The wheelchair-bound Professor Saibaba is presently “on the margins of life” in the notorious Nagpur prison, under brutal conditions of incarceration where basic health assistance has been denied and he reels “under excruciating pain relentlessly”. Prof. Saibaba, despite his medical and physical condition, has been in the forefront of democratic struggle for safeguarding the rights of the underprivileged, the deprived, the poor and the powerless. He was an extremely popular teacher at Delhi University, with a passionate interest in reading, researching and teaching literature. On June 6, 2018, Advocate Surendra Gadling, professor Shoma Sen and activist Mahesh Raut were taken from their homes in Nagpur and in a coordinated operation, the police arrested activists Sudhir Dhawale in Mumbai and Rona Wilson in Delhi. The India 5 have been accused of being “top urban Maoist operatives” and have been charged, like Prof Saibaba, under sections of the draconian Unlawful Activities (Prevention) Act or UAPA, which includes provisions to ensure long detention and make it difficult to obtain bail. The 5 are outspoken, high profile activists: Adv Surendra Gadling is General Secretary of the Indian Association of People’s Lawyers; Prof Shoma Sen is Head of the Department of English at Nagpur University; Sudhir Dhawale is the Editor of Vidrohi Magazine; Rona Wilson is Public Relations Secretary Committee for the Release of Political Prisoners; and Mahesh Raut is an anti-displacement activist from Bharat Jan Andolan and former Fellow at the Prime Minister’s Rural Development (PMRD). They are accused of spreading “hate speech” and even plotting to kill the Indian Prime Minister. In fact, the arrests are clearly a further attempt to silence voices critical of PM Narendra Modi’s ruling BJP party and its Hindutva-linked supporters. The June 6 arrests are also clearly linked to the case of Professor G.N. Saibaba. Adv Surendra Gadling, who has previously faced constant harassment for handling Prof Saibaba’s case, was due to attend a hearing about Saibaba’s bail request two days after his arrest. The only “crime” of GN Saibaba, his co-accused, and the India 5 has been their consistent defense of the rights of Dalits, Adivasis (indigenous) and other exploited and oppressed peoples in India and their opposition to the brutal Operation Green Hunt in Central India involving around 100,000 Indian military forces against the Adivasis and their allies, the Indian Maoists. The ILPS calls for the immediate release of Adv Surendra Gadling, Prof Shoma Sen, Mahesh Raut, Sudhir Dhawale and Rona Wilson. We also repeat our call for the unconditional release of the wheelchair-bound Prof Saibaba, who continues to be held in the Nagpur prison with basic health needs denied. The Indian diaspora in Canada is over 1.25 million strong and thus has a voice that carries weight in India and here in Canada. Please take time to learn more about the plight of the political prisoners in India and about their lives before and after their arrests. Some information can be found on the websites of the ILPS: www.ilps.info and https://ilps-canada.ca/ And join with other concerned Canadians to call on the government of Canada to raise the issue of political prisoners with the government of India and to call for the release of Prof. Saibaba, the India 5, along with all the other political prisoners in India.